The leavers' celebration was amazing. Children and parents took part in different activities, which saw families enjoying time together and having fun. Then, for the serious part of the evening in the school hall, we reviewed this academic year and all that has been achieved, we gave the Year 6 children the send-off they deserve and we awarded new positions of responsibility to the incoming Year 6 children. KS2 visited the Purcell School for a Year 11 concert this week, It was great fun to see so many instruments being played. Their concert took us around the world in 60 minutes. Afterwards, many of our children said that it had inspired them to do more music practice in the future! FT and FW presented class assemblies to their parents. Both were well-rehearsed and full of singing and dancing. All of the children performed well and were extremely cute too. KS1 and KS1 children played interhouse hockey and netball matches on Tuesday afternoon. This initiative came from the house captains, who organised the whole event from start to finish. They sorted the teams, planned the certificates and chose the "men of the match". They have our full respect for organising the afternoon so professionally. Congratulations to the winning house - Rowling - and to the four "men" of the match; Amelia H, Kavyasree, Rayhan and Heidi. On Tuesday, the KS2 children took part in Longwood's first ever swimming gala. It was so much fun and everyone enjoyed taking part in front crawl, breast stroke and back crawl races. Points were won for the houses and it was neck and neck between Dahl and Blyton. The relay race, where every child had to swim with an article of clothing , which was then transferred to the house captains, who had to swim a final length fully clothed, was the decider. Huge congratulations to Blyton. Sports Day was another truly wonderful day. We were really lucky with the weather, which turned out to be perfect - not too hot and no rain! In the morning, the preschool children took part in a carousel of four different games and then did a house relay. The parents also had a race and won points which went towards their child's house. The winners of the preschool race were Blyton (red). Then the rest of the school joined preschool on the field for a whole school family picnic. It was lovely to see everyone sharing and enjoying quality time together. It made me very proud of our school. After lunch, the main sports day started with a selection of team games where the children rotated around eight games, winning points for their houses. Then we held more serious races; flat, egg and spoon, skipping and sack races. These were followed by some parent races and then the house relays. We returned to school for the certificate awards and then medals and the trophy were awarded to the overall winning house, which was BLYTON. The school fete was a huge success. We were lucky with the weather and the school gardens looked stunning. We had an excellent turnout and there was plenty to keep everyone entertained. Children enjoyed the bouncy castles, face-painting, beat the goalie, obstacle race and lots of fairground games, whilst the adults enjoyed some wonderful food and drink and a well-stocked bottle tombola. The raffle was a highlight, as was the performance of our school choir. The whole event was a lovely day and we raised �1850 for school funds in the process. This week, we have enjoyed having a book fair in school. Many of the children have bought a book for their home library. It has been lovely watching them making their choices and trying to convince their parents! We have raised about �200 for Longwood from this sale. Thank you to everyone who supported this event. Yesterday, we joined in with the national World Book Day. There were some great costumes and everyone loved showing them off in assembly after lunch. Children in FS upwards then took part in an inter-house book quiz. Well done to everyone for taking part, but especially to Dahl who were the winning house. Wow. What a day. Taking part in the Young Voices Concert at the O2 was such an opportunity. Everything was perfect. The children all behaved impeccably. The traffic was on our side and we couldn't have wished for better weather. We had some time for a play in a park between Pizza Hut and the O2. Nobody complained or nagged about anything and our seats were just the best. Thank you to all parents and friends for coming and supporting the children and for making sure that they were all well-prepared. Thank you to Tracy Hunt for helping out and to Mrs Breaker and Madame, who were both great as always. A HUGE thank you to Mrs Sangster. The children were so well taught and sang their little hearts out. A real day to treasure! Our annual Musicians' Assembly, which was widely anticipated, did not fail to impress. Thank you to Mrs Sangster for organising a real treat. The children performed to a full house and it was lovely to see such an array of talent. Children of all levels sang and played piano, flute, flugel horn, French horn, trombone and electric guitar. At the end, there was a Gamalan ensemble, from our UKS2 class, played on xylophones and glockenspiels. Such performances do not just happen; they take a great deal of practice and determination (as well as courage). Well done to all performers. David Lawrence spent the day at Longwood today. He will be conducting us at the Young Voices concert at the O2 Arena in London in February. Today he worked with all children in the school, inspiring us to sing beautifully. 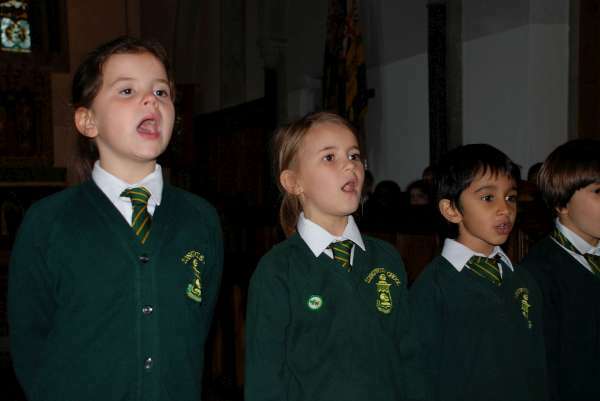 The choir practised some of the Young Voices repertoire. The younger children learnt some new Christmas songs and David worked with KS2 on their pantomime songs. Even our youngest pre-schoolers had a session with him and learnt SIX new songs! It was a fantastic day and now we cannot wait for the concert in February. On 18th November, we had a Children in Need day. Everyone dressed in spots and donated �1. There was a hula hoop competition at break time, organised by our Events Captains, Tiana and Max. They also led assembly, explaining to us how our donations will be spent. We raised �235 for Children in Need. The annual harvest festival was a lovely occasion. We all met in St James' Church. Father Graham led us through a world tour, explaining what each continent contributes most to our harvest. Each class sang a harvest song and had prepared something extra too - UKS2 wrote their own harvest poem, LKS2 danced for us, KS1 showed us their tree pictures and FS sang us a song about apples. The table of donations was groaning. After the service, parents and friends enjoyed coffee and cakes in the church hall. Another lovely Longwood celebration! Our McMillan coffee morning was a big success. Thank you to everyone who donated a cake and to everyone who came to support. There was a lovely atmosphere, with parents and friends being served by our Year 6 pupils. Our events prefects, Tiana and Max, worked hard to make this event a success. They organised a "guess the number of spots on the cake" competition, which Kristina won, and they also suggested a "cake-off". This inspired 17 children to get baking and their creations were wonderful. Mrs May and Mr Livesey had the honour of being Mary Berry and Paul Hollywood. It was really hard to choose, but in the end, they chose two runners-up; Alex and Heidi/Lauren. The overall winner was Archie. His igloo cake looked spectacular and tasted delicious. We raised over �380. Well done to everyone.